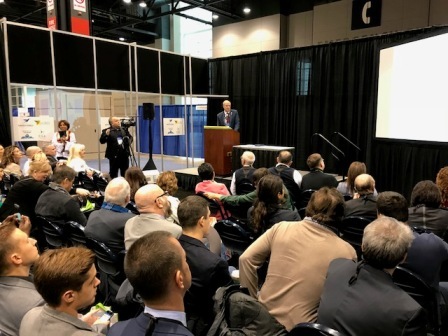 The Ambassador of the Republic of Serbia to the United States Đerđ Matković presented the possibilities and advantages of business and investment in Serbia from the stand of the Global Real Estate Theater at the NAR Conference & Expo Realtors in Chicago. Representatives of NAR, participants of the conference and fair, representatives of NAR's partner organizations from several countries, as well as representatives of the Serbian Real Estate Cluster, attended the presentation. Ms. Alicia Matheson, a representative from the American association announced the presentation and spoke very affirmatively about Serbia. "The presentation of Serbia at such events as this one is very important and useful. Our participation and established contacts contribute to cooperation, in attracting potential partners to invest in Serbia, to education, as well as to getting acquainted with foreign experience and regulations in the area of real estate, otherwise significant economic branches of each country," stated Nenad Djodjevic, President of the Managing Board of the Cluster Real Estate of Serbia. This is the largest annual conference and real estate fair in the United States which brings together business people in real estate, development and investment. More than 20 thousand business people participated in the conference and fair, including the representatives of partner organizations from over 60 countries. The Real Estate Cluster of Serbia is a partner organization of the US National Association of Realtors. Representatives of the Cluster of Serbia had numerous meetings with representatives of the NAR and partner organizations from all over the world.